I heard about this during my presentation at Fredericksburg this past Sunday. The day before re-enactors from the 28th Massachusetts and the 47th Virginia marked the 146th anniversary of the battle with a historic handshake over the famous stone wall at Marye’s Heights. It’s arguably the most powerful example of our Civil War community’s obsession with the themes of reunion and reconciliation. I don’t really have an opinion about it one way or the other. The NPS decided to allow it and I trust their judgment. In the end, I think the gesture reflects our interests more than the soldiers themselves or anything having to do with history. It’s more about our needs. But it does point to a question of what these men and women who don uniforms claim to be reenacting. If they are reenacting Civil War soldiers than it seems to me they run the risk of being characterized as emotional farbs. These guys worry about getting the outward appearance just right, but what about the emotional outlook of the Civil War soldier? Where is the bitterness and outward expressions of anger? What exactly are you reenacting at the stone wall? Interesting point. I don’t recall any point in the war where both sides shook hands. Isn’t a reenactors job solely focused on making things as authentic as possible?…instead of being friendly “softies”-somebody grab me a tissue! Ed, — Thanks so much for the image. Do you have any idea what year it was taken and/or the event which brought them together. It still leaves us with the question of what exactly those involved in the hand shake on Saturday were reenacting. 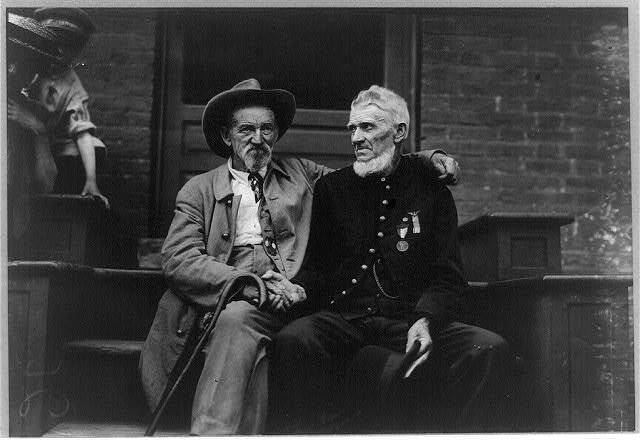 So there is definitively a history of our Union and Confederate ancestors shaking hands after the war. Thanks again Ed. Of course, there are images of veterans shaking hands, the most famous of which are from the 50th anniversary at Gettysburg. I never denied that there is a history of this. Most reenactors focus on the war years rather than the postwar transformation of some of the veterans. Kevin, then one should also ask why did they present both flags on Sunday after your speech and why did the CSA re-enactors give a cheer for the Irish brigade (they were not the Irish CSA troops)? Much of the activities on Sunday were fake, but I find nothing wrong with them stepping out of character to show that the nation “is healed”. I would have liked to have been there on Saturday also. I disagree that the ceremony on Sunday was “fake.” In fact, I think it held great meaning for those who chose to attend. I am also not suggesting that there was anything wrong with the hand shake. As usaul, I am simply asking questions about how we choose to commemorate and remember the war and the men who fought in it. Kevin, I think I was not clear. When I say fake, I mean that it is 2008 and we had a speech in a national park, which did not exist in 1862. Certainly the walk through town with Ranger Frank and the Irish brigade was close as close to reality as we could get. What I am trying to say is that we are looking at all of this 146 years in he future so of course there will be differences. I think the handshake was a great thing, along with all of the activities on the weekend. Thanks for the clarification Stuart. I just want to clarify that I am in no way suggesting one way or another whether the hand shake was a good thing. It was just a short commentary on what we deem worthy of remembrance and the form it takes. Along the lines of Ed’s post on Gettysburg … Reverse side of the 66th New York Monument (“Governors Guard” — Zooks Brigade)on Sickles Avenue near the Loop at the Wheatfield has a bronze plaque on the back entitled “PEACE AND UNITY” that depicts a Union and Confederate soldier sharing a canteen and shaking hands. Although it’s right on the auto tour route, almost no one sees it because its on the back of an otherwise very non-descript monument. It’s hard to even photograph because there are trees in the way. I can’t think of another of Gettysburg’s regimental monuments that celebrate the reunion theme. That is why this one is notable. As to reenactors … ever since my introduction to some of the militant ones on America Online back in the late 90s, I have tried NOT to understand reenactors. =) Seeing the word “farb” again brought back memories. haha. Having reenacted in the past, I can say that most reenactors arent interested in ugly side of things. They want the Currior and Ives version of the war. I well remember doing the 135th Bentonville as North Carolina State Troops, needless to say they were not in a good mood at the time of that battle, and having a Union soldier want to come and trade coffee for tobacco, he received a volley of musketry, and then cursed us. Way to often that is what you have, the in between battle trade, the Kirklandish canteen to the wounded enemy, and the handshake over the wall. Rarely do you see the shooting of the wounded, the killing of prisoners, etc, unless your doing Union in Georgia . Thanks for the comment Lee. I don’t know much about reenacting so I will not speculate on motivation or much of anything else having to do with the practice. That said, it strikes me as odd that so much attention is placed on getting the clothing and equipment right, but when it comes down to the perception of the enemy they adopt the postwar reconciliationist attitude. I have to wonder if reenacting would be as popular if it wasn’t for this reconciliationist backdrop. I think it would be, right now World War II reenacting is growing in popularity.